Coolest Stack O’ Pancakes Cake! 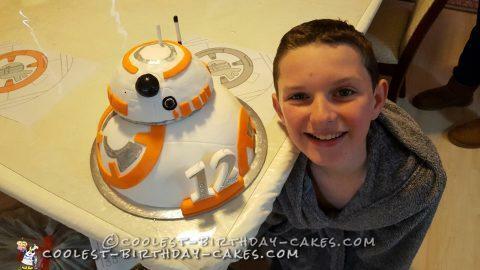 My Son wanted BB-8 from Star Wars for his birthday cake this year. It did not turn out how I wanted, but at a 10 inch diameter, it weighed a good 3 1/2 kilos. It is iced with rolled fondant. I used orange butter cream to smooth between the cake and fondant. It was unfortunate as I spent hours baking the cakes as my son wanted a round BB-8, but the bottom half collapsed under the weight of the top. If I get the chance to make another similar cake, I will try with a different mix that is a little lighter. Even though this cake did not turn out as wanted, it was still a massive hit with the kids. It ended up being served to 18 kids and many adults and there was still plenty left for later. The only other thing I will do next time is get a heating rod to help cook the middle of the cake evenly through. I think this might have stopped the bottom half collapsing.